【 The XV-01 Hits the Road! 】　Presenting the XV-01TC PRO chassis kit, in which the front motor-driven 4WD XV-01 PRO chassis is packaged with dedicated on-road spec parts to give a dynamic driving experience. 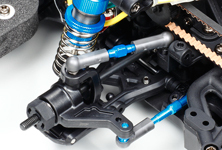 These include reversible suspension arms, TRF dampers, and aluminum turnbuckles on 4-wheel double wishbone suspension. The drive train utilizes a sealed gear diff. and direct coupling to enable drivers to adjust settings according to surface, and features front and rear clip-type assembly universal drive shafts. Fenders and r/c equipment cover have been removed from the chassis to make it lightweight, and the set includes a transponder holder. 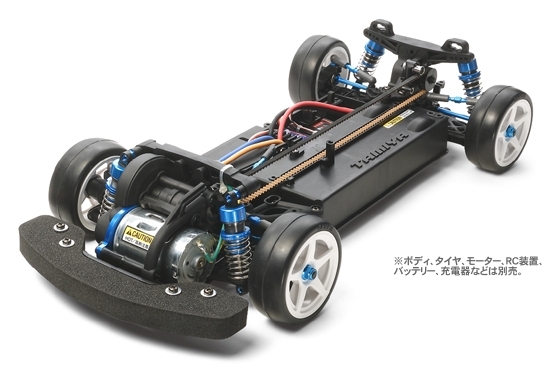 【 Front Motor, Belt Driven 4WD 】　The box-shaped main frame of the chassis serves many purposes, for example ensuring that dust and debris doesn't enter in great quantities and any that does can leave via the opening on its underside. 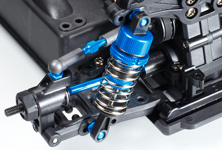 It also covers important parts such the gearboxes, drive belt, r/c equipment, and battery, protecting them from damage. Elsewhere, the TRF dampers give the 4-wheel double wishbone suspension good stroke to match the stability provided by the front-mounted motor. The longitudinally-mounted battery can be removed from the underside, eliminating the need to remove the body each time, and the front bumper protects the chassis in the even of a collision. Uses TA06 parts such as short suspension arms and uprights, in addition to TRF dampers. The long tie-rod steering gives great feel. 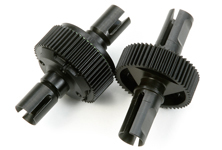 Clip-type assembly universal shafts feature front and rear, and the suspension mount is a touring car type. Front direct coupling and rear sealed gear diff. come as standard, allowing you to adapt your settings to the road surface. 【 Specifications 】　●Length: 384mm、Width: 185mm ●Wheelbase: 257mm ●Monocoque type frame　●Belt Driven 4WD ●Front Direct Coupling and Rear Gear Differential ●3-Piece Steering Tie Rod ●4-Wheel Double Wishbone Suspension ●TRF Dampers ●Gear Ratio: 8.04:1 (When using kit-standard 68T spur gear and 22T pinion gear) ●Ball Bearings ●Motor and Speed Controller (ESC) are sold separately. Information is correct as of February 18, 2013. Specifications are subject to change without notice.